When having mold removed it is in your best interest to use a company qualified and certified to perform such services. KIWI is an IICRC certified company that can perform mold removal services for water and flood damage. In recent years the Centers for Disease Control (CDC) have issued updated guidelines related to mold removal in response to hurricane related water damage in places like New Orleans. The recent flood damage taking place in Galveston and elsewhere also demonstrate the need to understand mold removal even in typically non-flood prone areas. Here is what you need to know about mold abatement, clean-up and potential health risks. Molds, mildews, mushrooms and yeasts comprise a group of living organisms known as “fungi”. Fungi of all types are distinct from both plants and animals yet have similar characteristics of both. For example, fungi have cell walls like plants but cannot produce their own nutrients. Molds and mildew both reproduce by spores which require moisture and nutrient to grow; unfortunately, as far too many homeowners are aware, the conditions of many homes right after water damage provides the perfect environment for molds to begin rapidly growing; a warm humid environment with wood, wallboard, upholstery and other “nutritional” sources. Research has found that mold begins growing on some materials – like plywood – in just 48 to 72 hours. Not every mold is harmful to human health and in fact, some are used as the basis for medications while other molds are known to release toxins that can harm humans. The higher the concentration the worse the problem although some sensitive individuals may respond severely to even fairly small amounts of molds, mold toxins or even by-products of molds. Common health problems related to molds include allergies, respiratory problems including Asthma, headaches, skin rashes, headaches, flu-like symptoms and even complex systematic illness. Persons suffering from other conditions like HIV/AIDS, cancer or other auto-immune problems may also be at increased risk of health related issues as are the elderly and infants. Because mold, mold spores and mold toxins can be via skin contact, inhalation or ingestion; many people may not even realize they were exposed to mold or mold spores by coming into contact with airborne concentrations of mold from old buildings, air vents or even used furniture. The first step in mold removal is to take proper steps to reduce the risk of illness or injury to ones self or others. The CDC encourages protective gear including eye, respiratory mask and other barriers. Mold removal will then depend upon the length of time, items impacted and severity. 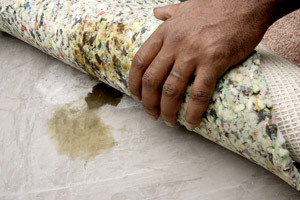 In all cases, contaminated items of an absorbent nature (upholstery, drywall, wood, etc) will need to be professionally evaluated to determine if they can be salved or must be replaced. Likewise, mold clean-up usually includes air conditioning systems, water extraction, humidity control and proper disposal of all waste in addition to the actual repair of damaged walls, flooring and furniture. It is typically advisable to go with a full service company like KIWI Services that provides all required work with just one call with the added benefit of being certified by the Institute of Inspection Cleaning and Restoration.